A posting of a world record egg generated almost 50 million likes on Instagram following a Sunday January 13th debut. 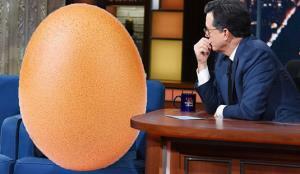 During succeeding days, the enormous egg was featured on late-night talk shows including popular Jimmy Fallon and Stephen Colbert programs. The American Egg Board took the initiative to climb on the mega-egg bandwagon and has incorporated the theme into the How you do like your eggs? Campaign. Coverage of the Incredible Egg’s debut has generated more than 115 million impressions.